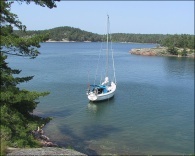 Solitary anchorage in the North Channel. Sailing above the rapids on Lac Deschenes. Watery reflection on the Ottawa River. End of day on a pier. Women sailing before the race. 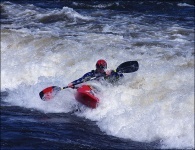 Kayaking off Bate Island on the Ottawa River. A sailor's delight. A sunset in Pontiac Bay. Lasers sailing in the glitter. A flock of sails waiting for the race. A sailboat mast peeks above the rocks.